Wow that was a nice little vacation. Batteries are recharged and I’m ready to begin again. Only, not with the preplan that was passed by me on Saturday. It would have had me wait around until 1500 on Monday to get live loaded in Carthage, MO then run all night to make an 0600 delivery in Lufkin, Texas on Tuesday. Ah hell no, in other words. I drive a white 2007 Volvo 780 tractor with a 2006 Volvo D12 engine and a 13-speed manual transmission. The truck was built in October of 2006 and sat at a dealer lot until June of 2008 when I started driving it. It started with 1,337 miles on the odometer and as of this writing has just over 210,000. The things I love about my Volvo include its very tight turning radius, huge and well-organized interior (the lower berth converts into a table with two seats like an RV), the largest refrigerator of any non-custom truck and a very, very fuel efficient engine and aerodynamic combination which gives me great fuel economy. How do you calculate fuel economy? The only way to truly determine fuel economy is to take the actual fuel expense (what you pay at the pump) and divide it by the miles driven. Since there is always some amount left in the tanks from week-to-week, you need to do this over time, such as a month or a quarter. Purists could note that I lump together my company discount at the pump into the fuel expense, and they would be correct. Its just that I’m too lazy to break it out and it doesn’t effect my end cost as calculated. How can you stand driving at 60 MPH? It was real easy for me once I did the numbers and decided how I would make money in this profession. The only large variable expenses you have as an owner-operator are your pay and the money you spend on fuel. In order to maximize my pay, I have to reduce my fuel expense. Think of it like a teeter-totter: the more you pay for fuel, the less you pay yourself and vice versa. One of the checks I make of my progress is to determine what my CPM pay is. As a company driver, I think it is reasonable to expect somewhere in the low 40’s per mile with the right company and experience. 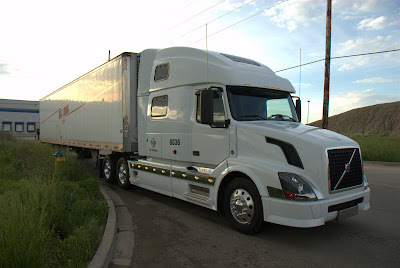 Since I take on additional risk and work as an independent, my goal is to consistently achieve over 50 CPM net pay after all truck expenses (excluding my personal taxes and the costs of vacation time, health care and the like that company drivers enjoy). With 133,303 paid miles in my first year my net was $67,740, which is a 50.8 CPM. I achieved this with an adjusted fuel expense of 11.73 CPM. If my fuel expense was just 20 CPM (which is a truck getting 6 MPG with zero out-of-route miles and zero idle time), my net pay would be merely 42 CPM, or what I could expect to make with much less exposure as a company driver. That’s why I drive 60. After spending a restful night ghetto parked in an odd spot in Rochelle I took my load in to one of the three Sara Lee places we deliver at in town. You know, the one on the bills. Naturally, they weren’t having any of that and sent me and another HB driver down the street to location #2. There, the guard says we can’t drop those trailers on his lot without the people at location #1 signing off on our paperwork first. We both pull a u-turn in their lot and head back up the street to the first place. Nope, minimum-wage security guard is wrong and we can damn well drop the trailer over there comes the answer from the helpful clerk at location #1. They have someone phone over to the guard and straighten him out and by the time we have returned to location #2 and wait through a long line of trucks we’re given clearance to drop in their yard. There aren’t any empties so I cruise over to location #3 and snag the only one there (sorry, fellow HB driver!) then wait a few hours for my next assignment. I’m told to take my empty reefer down to the PetSmart DC in Ottawa, Illinois and swap it for a trailer full of live fish heading to distributors in Memphis, Tennessee and Little Rock, Arkansas. The schedule is tight and I have to arrive in Memphis in time to take my 10-hour break, unload at 0500 then be in Little Rock by 0900. I really wanted to take a shower along the way but I didn’t have enough time and though there are not one but two Pilot truck stops within a mile of my first stop I dare not stop there (the ones in Memphis are a very bad place to park). Right at 0500 the first receiver is ready to go and by 0530 I’m rolling to Little Rock. By 0930 the last of the fishies are off and that load is in the books. There are many things I like about the way Hill Bros operates. I like the number of pre-plans that show up, for instance. I like the accuracy with which they send me home when I ask: I tell my dispatcher a week or two in advance when I want to be home and almost without fail I’m there that day or the day after. One thing I do not like about the operation here is how they get owner-ops home. Here, they do not pay mileage from the last drop you make to the house so where you are stranded dispatched last makes a big difference. Much of last year my last load would leave me in Carthage, Missouri, roughly 50 miles from the house and I felt this was reasonable. The last three times I’ve come home I have had to deadhead (on my own dime) 175 – 210 miles. Since it costs me about 75 cents per mile to operate my truck this translates into more than $400 out of my pocket to come home three times. I was told last year in orientation that they would strive to get owners to within 100 miles of the house before sending them home. My repeated complaints by phone and satellite unit to my dispatcher haven’t resulted in a resolution to this issue and I suppose I will have to take it up with Ross, head of operations when I get back to Omaha next. Late yesterday morning the weekend dispatch crew told me to head a couple miles east in Omaha to a bakery to pick up a load heading to Rochelle, Illinois for Sara Lee. Having been to this facility once before, I innocently asked if they wanted me to bobtail over or if I needed to bring a trailer. The docks are fairly difficult to back into (you have to block the street in front for several minutes to get the truck oriented properly) and I was relieved to hear that they had enough trailers over there already and I could bobtail. HB had four loads of goodies heading to Rochelle, all identical. The order number that I was given happened to be the last one on the list for the plant, and I was told they were taking product straight from the production line for each trailer. Not having anything better to do I made lunch, watched some videos and took a snooze. Around 1400 the shipping clerk came out and knocked on my door. “The driver for this load hasn’t shown up yet so back under trailer ##### and you can take it.” Sweet! The load was just over 25,000 pounds so no need to scale and I was shortly on my way fighting a brutal headwind from the East. About seven hours later I arrived at our fueling stop in Rochelle to spend the night, since our receiver doesn’t take trailers early on Sundays but will this morning. I got running around 0700 this morning, heading north to Fort Collins. At the guard shack I parked my truck (after scaling) next to a CFI truck and opened up the rear to show them it was nice and clean. The guard then asked if I could help the CFI driver with her tandems since they were old and rusty. Sure, no problemo. I grabbed my new STA-RAT bar thinking this would be a great time to test it out for the first time, forgetting that almost every CFI trailer uses a vertical tandem bar that it can’t help with. Ah well. A small dint of effort (and my right forearm banged up against the underside of the trailer — I had forgotten how fun that was at CFI) and the tandems decided I was the boss and did their part. After chatting with the lady driver for a few minutes I left to drop my empty and pick up the loaded trailer. Since the trailer number was 7118, I knew it would be old and crusty as well, as our oldest trailers begin with “71”. This gave me the opportunity I had been looking for to try out the STA-RAT bar and it worked as advertised. Yay team. There was quite a bit of room in the rear of the trailer so my first concern was it was loaded too heavily at the nose end and I might have to have them rework it. I slid the tandems all the way up to try to get as much weight to the rear as I could then blocked off the load with a couple of my load bars. Damn I’m good and damn I’m lucky, as the 44,500 pound load put my drives at 34,060 with the tandems all the way forward. I only made one stop between there and Omaha, and that was in Big Springs, Nebraska where I had another steak at the Sam Bass Saloon located next to the Bossleman Pilot there. Mmmm mmm good. Since this load doesn’t deliver until Monday morning I’ve t-called it here in the yard. I’m going to chat up the morning planner tomorrow to see if I can get an out-and-back load or loads tomorrow so I can deliver it and get my new (brand new) load locks back. The word this morning from On High was that I would be grabbing a load of spuds from Colorado and taking it to San Antonio, Texas for a Monday morning delivery. Three full days for 900ish miles with a set appointment at a grocery warehouse. The load was given to some other lucky customer and I was asked to take the empty reefer I picked up last night at FedEx over to nearby Fort Morgan, Colorado and drop it there at a Cargill meatpacking plant then bobtail back to FedEx and grab another empty. A new plan popped up. This one had me picking up a loaded trailer from the Bud plant in Fort Collins, Colorado on Sunday morning and delivering it in Council Bluffs, Iowa first thing Monday morning. Since this is Friday and I wasn’t really feeling like waiting for the entire weekend for this load I put in a call to Alex, my dispatcher. It turns out this load is ready to go early and if I can’t make it there by the time they stop receiving tomorrow I can just drop it in our yard in Omaha and a local driver will take it over first thing Monday morning. That sounds much better. I cracked an eyelid after 1100 yesterday morning, having slept late because of the hour I got in on that Emporia load. On the plus side, I found a small gas/diesel stop a couple blocks from the Tyson plant that I’ve driven by at least a dozen times without realizing they had truck parking there and it was a lot quieter than the Flying J at the other end of town. Today’s orders are to head over to Wichita and pick up a load leaving at 1500 bound for Henderson, Colorado by 0100 tomorrow morning. Its right at 600 miles for the day which is a solid bit of driving. Only FedEx has its own ideas about what 1500 means. In their playbook they start loading a trailer around then and I actually leave an hour later, at 1600. This puts me an hour behind which is all time cushion anyway, but I would have at least liked to be able to taken a longer break to eat, get a power nap or the like. Not like they care about my creature comforts. The drive was boring and profitable. I cruised down the long stretches of highway at 60 MPH and made the mistake of believing our dispatch when they told me Colby, Kansas was the cheapest fuel I would get along my route. It was eight cents a gallon cheaper in Denver and I definitely would have driven a couple miles extra to save that kind of money. Ah well. I arrived and swapped trailers in Henderson by about 0030 local time then hit the sack along a fairly quiet street in front of FedEx.